There are two main ways to get to Puerto Jimenez by land: by car and by bus. The distance is roughly 200 miles (320km), and it can take from 5.5-8 hours depending on the weather conditions, time of day, type of vehicle, and driver. Renting a car in Costa Rica only requires a driver’s license and credit card. There is only one car rental agency in Puerto Jimenez, Solid Rent-a-car. You can also rent a car in San Jose and drive it down. There is a drop-off service that some of the rental car companies now offer; it costs between $100-$150 for drop-off or pick-up, and a driver will bring the car down to the Osa (or pick it up from the Osa and drive it up to San Jose) for you. If you are using Solid Rent-a-car check the chart below. 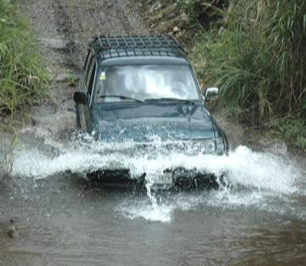 You will need a good 4-wheel drive vehicle in the Osa Peninsula. Expect to pay between $350-$750 U.S. dollars per week for a car. Car rates listed here are subject to change without notice. Please contact Bosque del Cabo for assistance with reservations. There are two major routes to get to Puerto Jimenez from San Jose. The first route is along the Pan-American Highway, which leaves south from San Jose through Cartago and over the mountains of Cerro del Muerte, going down into San Isidro, and onto the Osa Peninsula. The other route, the coastal route, leaves west from San Jose and goes via Quepos, and then south down the coast until it meets the Pan-American Highway in Palmar Norte, then onto the Osa Peninsula. The coastal route is the faster route, as the road is newer and in better shape. Approximately 30 kilometers past Palmar Norte is the turn off for the Osa Peninsula, at Chacarita. There is a large gas station on the right hand side of the road, where you will find a sign that gives the mileage to Puerto Jimenez (77 kilometers). After this turn off, the road can be in very bad condition and it will probably take 1 ½ hours to reach Puerto Jimenez. Once in Puerto Jimenez, you may want to relax and fill your car up with gas (the gas station in Puerto Jimenez is the only one on the entire peninsula). Bosque del Cabo is 22 kilometers from Jimenez, and it will take you approximately 45 minutes to reach. You will have to cross several streams before you get to the lodge and if it is raining hard, you must exercise caution and check the water depth of creeks. 2 kilometers after you start to climb some very steep hills and the road flattens back out again, you will find the Bosque driveway on the left-hand side. It’s the third left after the entrance sign for Lapa Rios. There is an entrance sign (reading “Bosque del Cabo 1.5 km”) inside a planter shaped like a large triangle. The driveway is 1 ½ kilometers long. We strongly suggest that you arrive before dark, as these roads can be difficult to negotiate in the dark. Daily bus service leaves from San Jose (Barrio Mexico) at 8.00 AM and 12.00 noon to go down to Puerto Jimenez. The bus ride will be approximately 9 hours, and costs around $11 per person each way. Daily bus service leaves from Puerto Jimenez at 5.00 AM and 9.00 AM to go to San Jose. The bus ride will be approximately 9 hours, and costs around $11 per person each way. This is a long, tiring bus ride, and while it is not necessarily dangerous, it is best done by the adventurous. Be aware that often times the roads down to the Osa Peninsula are in really bad shape. There is always an option to get a taxi ride from San Jose down to the Osa Peninsula. This is an expensive option, probably around $400 one way. We can set up the taxi ride for you with a reliable taxi driver that we regularly use. The ride will be around 7-8 hours. Please inquire with us if you would like more information about this option.